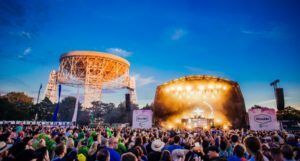 Bluedot Festival will be returning to Jodrell Bank Observatory in leafy Cheshire — the home of one of the world’s largest radio telescopes — for four days of science and music, it has been announced. This year’s headliners will be The Chemical Brothers who will be joined by the likes of Flaming Lips and Future Islands for the four-day festival which blends world-class music alongside science talks held by some of the world’s most-celebrated scientists. Elsewhere, there will be an orchestral performance of the BBC’s hugely popular Blue Planet from the Halle Orchestra set against the backdrop of footage from the awe-inspiring nature documentary on the opening night. Also playing the festival will be The Orb, Little Dragon, Roni Size: ‘New Forms’ Live, Booka Shade, Adrian Sherwood, Gary Numan and Gilles Peterson. “Heading into our third year we really wanted to go above and beyond and we’re absolutely delighted to announce Blue Planet in Concert for our new Thursday night opening,” said Bluedot’s festival director, Ben Robinson. “Our mission is to not only erode the boundaries between science, culture, art and technology but to also highlight the beauty and fragility of our planet Earth, and what a better way to achieve this by opening proceedings with such a remarkable and enlightening spectacle. It’s going to be truly incredible and a real festival highlight. For tickets and more information about the family-friendly Bluedot Festival, head here.